Rejoice I did! when approximately 200 people made the commitment to go with me on our Prayer and Prophecy Tour! It was the trip of a lifetime! We felt as though we stepped into our Bibles. As one traveler commented, “The Bible has become a pop-up book for me!” For me, too! I continued to rejoice as we experienced the living water poured out upon us site after site, day after day. In reflection, I can’t possibly capture all the wonderful memories, but I do want to share the highlights of our tour with you. Along the way, the guides enriched our understanding of what we saw; my beautiful daughter-in-law, Jenny, enriched our worship by leading us in song at various sites; the bus shepherds enriched our travel time with their consideration, guidance, and prayers; we enriched each other through the friendships that blossomed, and Pastor Ray’s shepherd’s heart warmed us all while his prophetic insights enriched our faith in the truth of God’s Word. And in back of it all, Inspiration Tours attended to every detail so that our experience was smooth and seamless. Our flight from the States to Tel Aviv was six hours late, which was a blessing in disguise as it allowed me to have my first glimpse of Galilee at sunset. It was an indescribable joy to share this beautiful view with my granddaughter, Bell. The next morning we shared a spectacular sunrise as a backdrop for our devotions beside the sea of Galilee. The tour officially began on the Mount of Beatitudes. We gathered in an amphitheater that was nestled in the same hills where Jesus often withdrew to pray…the same hills where 5000 people were fed with five loaves and two fish…the same hills on which Jesus taught the Sermon on the Mount. I reminded all of us that one of the lessons Jesus taught when He fed the 5000 was that He can use broken pieces to feed and bless others. Together, we prayed the Lord’s prayer that He first taught near that very same place. Our next stop was the city of Nazareth, the place where Jesus lived and grew in wisdom, stature, and favor with God and man…the place where He submitted to His earthly parents for thirty years…the place where He worked as a carpenter and builder. While the city no longer resembles the little village where He was raised, we visited a reconstructed village that carefully replicates the original. We were blessed to have Botrus, the headmaster of a Nazareth school that has 1200 students–both Jews and Muslims–share his testimony with us. I then led us in prayer for him, as he is very much a minority as an Israeli Christian Arab Nazarene! His school is rated one of the top four schools in Israel. One of the highlights was learning how olives are crushed in order to extract the oil which then gave moving insight into our Lord’s time in the olive grove of Gethsemane the night He was betrayed. In the synagogue on site, I read from Luke 4 that recounts the time when Jesus read from the book of Isaiah, offering people forgiveness, freedom, and the favor of God. He spoke with such clarity and authority that initially all those who heard Him were amazed. I couldn’t help but wonder what it would have been like to hear the living Word read the written Word. But the crowd in the synagogue soon turned murderous as the people rejected what He had to say. We could almost hear their angry shouts as we stood on the very site where they sought to throw Him off a cliff. They were not successful because it was not God’s time or God’s way for His life to be given. While the scene on top of the precipice was ugly and dark, the view for us of the Jezreel Plain was spectacular. Throughout history, battle after hard fought battle has taken place here. Napoleon is quoted as having said it was a natural battleground, ideally situated for war. One day this same valley will be filled with the armies of the world as they gather for the final great battle of human history. We drove from Mount Precipice to the heart of the Plain—Megiddo—from which the name of the last battle, Armageddon, is derived. We sat in folding chairs, enduring temperatures that were well over 100º F, in order to listen to Pastor Ray Bentley describe the coming conflict as he stood with Tel Megiddo behind him. And all of this was just on our first day! God did not hold back! He poured out the living water of His Spirit and the fullness of His blessing from the beginning of our tour to the end. On the second day, we began early with an unforgettable boat ride across Galilee. I was reminded that Jesus sat up on the hillside that we could see from the boat, as He watched His disciples straining at the oars in a storm at sea. He then came to them, walking on the water, but made as though to pass by until they called out. What a comfort to remember that when we are in a storm, His eyes never leave us. Yet often He waits to intervene until we pray. It was in that same storm, on that same lake, that Peter demonstrated his willingness to leave his comfort zone and step out of the boat. While we know he faltered, I will always look up to him for his desire to experience the power of God in his life as he walked by faith. Our boat docked near the excavated ruins of Capernaum, the town Jesus chose as His home base for ministry when He left Nazareth. It was in this town that He healed the woman with the issue of blood when she just touched the hem of His garment. It was in this town He healed the paralytic who was let down on a pallet through the roof by his friends to the very feet of Jesus. It was here that Jesus healed the Centurion’s servant and a royal official’s son, both from a distance. And so it was in this place that Pastor Ray Bentley led in a very moving healing service. As he prayed over us, the sound of soft weeping mingled with the sound of gentle waves lapping at the shore…and we knew the Spirit of the Lord was present. While not all were healed, all were touched, for which we praise God. From Capernaum we went to Magdala, the home of Mary. The site is situated at the very spot where the old road from Nazareth to Galilee ended. The synagogue that has been excavated is almost certainly one in which Jesus taught. Ray and I were invited to step inside the synagogue, where we took a moment to pray. Our third day began on the top of Mount Carmel where Elijah confronted the priests of Baal. His remarkable faith was demonstrated by his obedience to God’s Word and his dependence on God’s power. It was no wonder his prayers brought the fire down that consumed the sacrifice and defeated the wicked priests. But God had promised rain, so Elijah got on his face, fasted, persevered, and prayed until the rains came. By his example, he teaches us not to stop short of everything God wants to give us, but to pray through until we receive what He has promised. From Mount Carmel we drove to Caesarea by the Sea. It’s a spectacular site that is memorable for several significant reasons. It was where the apostle Paul was imprisoned for two years, and the place where he also was placed on trial before Felix, Festus, and Agrippa. We walked among the sandy ruins where Herod’s palace had stood and where those trials most likely were held. And it’s the city where Cornelius lived—the Roman centurion to whom an angel of God appeared, instructing him to send for Peter. God had prepared Peter to go and share the Gospel, and God had prepared Cornelius to hear and receive Peter’s message. Cornelius responded by placing his faith in Jesus, and his entire household was saved! It was the very first time salvation was offered to Gentiles through faith in Jesus alone. They did not first have to become Jews. As we sat in the broiling sun of the amphitheater, Pastor Ray challenged us to be mindful of the “centurions” who are perhaps standing by, overhearing what we are saying, and longing to belong to God’s family by faith. From that point on, every time I spoke publicly to the tour, I tucked in a Gospel presentation, just in case there was a waiter, a hotel staff person, another tourist who was listening…and praise God! There were! In the background of this photo of Bell, my granddaughter, is the place where Paul was incarcerated. From Caesarea we drove up to Jerusalem! I had pre-arranged with the guides to play the Hoppers’ rendition of Jerusalem on all four buses. (Click here to listen) It made a thrilling entrance to the City of God! That night following dinner, I asked tour members to share their takeaways thus far—and when I went to bed that night I was still smiling with the joy of what God was doing in our midst that was evident by the things they shared. Amazing! I heard in their sharing so many answers to my own prayers for the tour! I had also invited Chris Mitchell of CBN News to share some of his insights into what God is doing in the region that he knows so well. He emphasized the importance of loving others in a genuine way as we share the truth with them. His real-life stories of death-defying faith were gripping. Pastor Ray also shared his knowledge of how God is moving among His people. 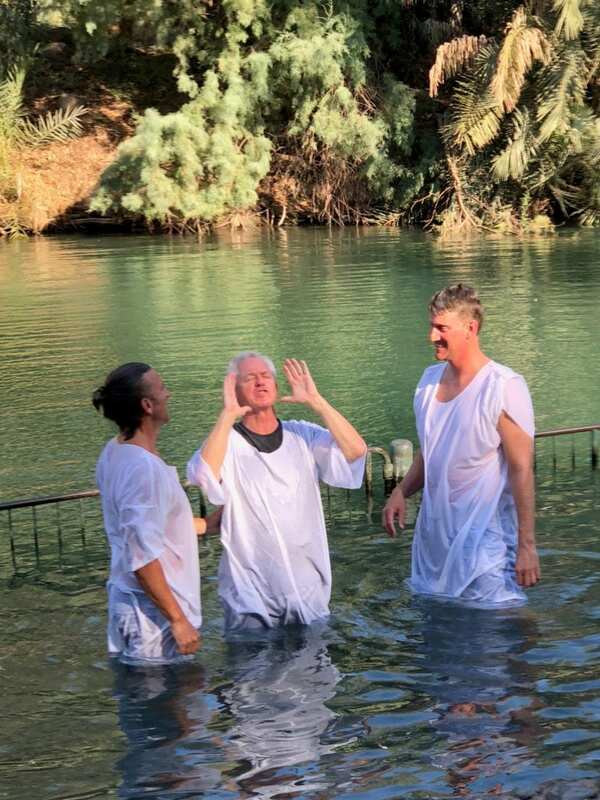 The fourth day of our tour began near Jericho at the traditional site of the baptism of Jesus. As we looked out at the muddy Jordan River Joshua crossed as he led the Israelites to enter the Promised Land…the same Jordan River in which the Syrian general, Naaman, was cleansed of his leprosy…the same river where Elijah tossed his mantle to Elisha before being taken to Heaven in a chariot of fire, I felt burdened to speak of the experience Jesus had following His baptism. Matthew tells us He was led by the Spirit into the wilderness to be tempted by the devil for forty days and nights. I described our adversary, and the armor we have been given to withstand and overcome him. I warned that often what we focus on is the obvious situation while the real problem is underneath in the spirit-realm. There were several times I was able to refer to this lesson, as the adversary sought to hinder us from receiving the fullness of God’s blessing. From the region of Jericho we drove to Wadi Qelt which overlooks the old Jericho Road that runs like a ribbon in the midst of the Judean wilderness. It was easy to envision a traveler being attacked by thieves and bandits as Jesus described in the parable of the Good Samaritan. The old road is referred to as the Valley of the Shadow of Death, which immediately brings to mind the promise in Psalm 23 that even in such a dangerous place, our Shepherd is with us. From Wadi Qelt we went to the Good Samaritan Inn which is built on the same site that housed the ancient Inn Jesus referred to in his parable. Pastor Ray moved us all to tears with his powerful testimony of personal suffering in his life and Vicki’s. From the Good Samaritan Inn we were treated to a fabulously abundant late lunch in a genuine Bedouin tent, served by a man who looked and acted like Abraham. Many tour members rode camels to the tent in order to more fully experience what lunch with Abraham and Sarah may have felt like almost 3000 years ago! The next day, while tour members went to Masada, Qumran, En Gedi, and then floated in the Dead Sea, I participated in a video interview in the Rose Garden of the Knesset (the Israeli Parliament in the background of the photo below). Chris Mitchell (left) conducted the interview for CBN with myself, Knesset member Robert Ilatov (right), and Albert Vexler (center). Robert is the gracious, visionary official host of the Jerusalem Prayer Breakfast, which I addressed on June 6-7. This interview was to encourage people around the world to continue to pray for the peace of Jerusalem. The tour prayed for me as I participated in the interview, and now I am earnestly praying that the discussion we had on camera was effective, and that people will pray for Israel! 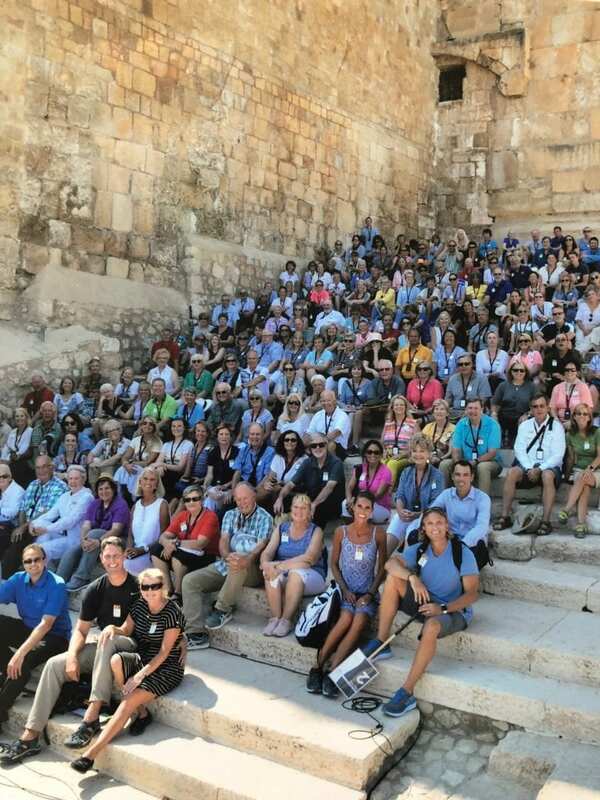 The tour returned to Jerusalem, and we all attended Joel Rosenberg’s Epicenter Prayer Summit that night and the next day. Joel had invited me to give the opening message on Daniel 9, challenging people to pray as Daniel did, so that Heaven is moved, and Israel is changed. In following up my message, Joel pointed out to the 1000 people seated in the Jerusalem Theater that Israel had been exiled for 70 years—removed from her land– because of her disobedience and rebellion against God. Today, Israel has been back in the land for 70 years, yet she has not repented and is plunging into serious depths of disobedience and rebellion. It was a solemn warning to the nation, as well as a strong compulsion to pray! On the second day of the Summit, Joel interviewed Arab and Israeli pastors who shared their challenges, frustrations, and blessings as they shepherd God’s people in a difficult situation. In speaking to one man on our tour, he said it had never before occurred to him to pray for Arab pastors leading churches in Israel. But the Summit opened his eyes and his heart as I believe it did for many others, leaving us with a deep burden to pray. Joel Rosenberg graciously asked if he could have a picture with me to promote The Daniel Prayer. I was delighted! The day after the Prayer Summit, we went to the Mount of Olives near the place Jesus ascended into Heaven and the very place to which He will return! When His disciples asked Him when that would be, Jesus gave them signs to look for that would indicate the end of the age. So with the city as a backdrop, I went through Matthew 24 and shared the signs Jesus gave to His disciples—signs that are being fulfilled right now—signs that I believe clearly confirm we are living in the last generation of human history. With that thrilling start to our day, and with the awe-inspiring view of Jerusalem before us, we then walked down the Mount of Olives, following the Palm Sunday Road. While it is now paved, it is the ancient road Jesus more than likely took on His triumphal entry into Jerusalem. We stopped briefly at Dominus Flevit where it is said Jesus wept over Jerusalem because He knew their rejection of Him would provoke severe judgment, then continued to Gethsemane where a private garden had been set aside for us. Following a time of worship led by Jenny, I read the Scripture that described our Lord’s prayer, pointing out that in one sense it wasn’t answered as the cup of suffering was not removed from Him. Yet His submission to His Father’s will brought great glory to God as well as redemption to us. When our prayers are not answered the way we want, it’s good to remember that our heavenly Father knows best. Pastor Ray then urged us to roll our burdens on the Lord, which we did as we had a quiet time of private prayer under the olive trees. That night we did something none of us, including our four guides, had ever done before. We went to the Shepherds’ Fields, gazed at the twinkling lights of Bethlehem (far right in the photo below), read the Christmas story, and sang Christmas carols in the very place Christmas began 2000 years ago! It was a personal highlight for many of us, including me! After walking through the Jewish quarter of the Old City and tucking our small written prayers into the Western Wall, we sat on the Southern Steps, many of which are the very same original steps that Jesus would have walked on as He entered the temple…the same steps He would have sat on as He taught those who gathered around Him…the same steps where Peter preached at Pentecost and 3000 people were saved in one day…the same place where the church was born! What an amazing place! I took the opportunity to remind us all of who the Holy Spirit is. He is Jesus…in us! Praise God! When Jesus went back to Heaven, He did not leave us as orphans. He has come to any and all who place their faith in Jesus as Savior and Lord, inviting Him into their hearts. The last day of the Israel portion of our tour was emotionally heavy. We visited the Upper Room which is similar to one in which Jesus held the last supper with His disciples. We walked through Saint Peter in Gallicantu, which includes the uncovered house of Caiaphas, complete with a dungeon and torture chamber underneath. The original steps leading to the Kidron Valley, and from there to Gethsemane, could be clearly seen as they separated the house of Annas, the former high priest who conducted the first trial of Jesus, and the house of Caiaphas where the second and third trials of Jesus were held. We looked down on the courtyard that is now paved over, but with a little imagination, we could see Peter warming his hands by the fire as he denied his Lord three times. We then went to the Antonio Fortress where Jesus was held between Roman trials. Carved into the stone pavement we could still see evidence of the games the soldiers played as they mocked their victims. We know Jesus was dressed in a royal robe, crowned with thorns, slapped, spit upon, His beard pulled from His face…yet, like the Lamb being led to the slaughter, He opened not His mouth. No teaching was necessary at this point. I simply read Isaiah 53. And wept. Our tour ended near a rocky promontory outside the Old City that looks like a skull. Executions took place there as criminals were shoved off the summit. If the fall didn’t kill them, they were then stoned to death. The base of the rocky outcropping was right beside the main road that led to Damascus and was the site many believe the Roman crucifixions also took place. It was almost eerie to think we were close to the place where Jesus died. I shared life-lessons that He teaches us from the way He handled His physical, emotional, and spiritual suffering. We then were given opportunity to return to the Cross and seal the commitments we made as Pastor Ray led us in communion. As wondrous as the Cross is, I didn’t want to end our tour there. So following communion, I read the first portion of Matthew 28 and his thrilling account of the resurrection! Jesus is alive! The tomb is still empty! And nothing…not the world, nor the human race, nor history, nor me…will ever be the same! Praise God! Great things He has done and is still doing! And great is our rejoicing! Jesus has risen from the dead! He’s alive!